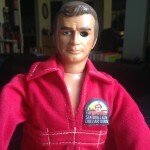 There was a time when the name Steve Austin was known not as a wrestler, but as The Six Million Dollar Man. This TV series, based on the novel Cyborg by Martin Caidin, ran from 1974-1978. 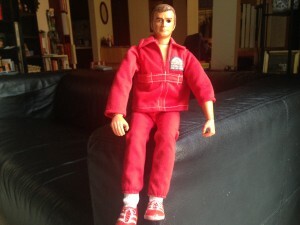 Pictured to the right is my childhood Six Million Dollar Man action figure. Not bad for approaching forty. One of the character’s features was his bionic eyesight, providing him with telescopic vision. Back then, such implants were still in the realm of science-fiction, but now they are becoming a reality. We’re getting closer to healing blindness. In this article on restoring vision, the fictional Steve Austin is even mentioned as one of the inspirations for developing the technology. What was once considered superhuman may one day become a simple medical procedure. Science inspires science-fiction, which in turn inspires science. As we age, our eyesight can deteriorate at a frightening pace. I often carry two or three headgear gadgets with me at all times: eyeglasses, sunglasses, or reading glasses, depending on whether or not I’m wearing contact lenses. Even if I never benefit from advancing technologies such as telescopic contact lenses, reading about them inspires me with hope. Do any advancing technologies inspire you with hope? Feel free to comment below. Tagged bionic eyesight, Six Million Dollar Man, Steve Austin, superhuman. “Science inspires science-fiction, which in turn inspires science.” Very true. The technology I hope for is an affordable robot cook/shopper/house cleaner. Especially the cook!